At the Capacity Tier step of the wizard, specify an object storage repository to which you want to offload your data and configure policies to trigger data transfer. You can only add one object storage per scale-out backup repository. 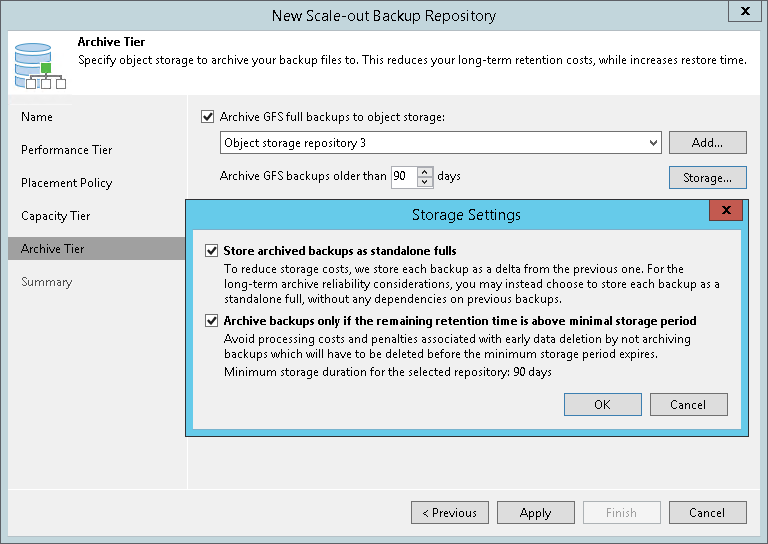 Select the Extend scale-out backup repository capacity with object storage checkbox. Select an object storage repository to which you want to offload your data. Make sure this storage has been added to your environment upfront. In case a cloud storage repository has not yet been configured, click Add and follow the associated steps of the wizard, as described in Adding Object Storage Repository. Click Window and specify at what time interval the offload job session can be executed to offload your data to object storage. The Move backups to object storage as they age out of the operational restores window checkbox is selected by default and cannot be deselected in this version of Veeam Backup & Replication. In the Move backup files older than X days field, specify the value that will define a period after which the backup data on your extents would be considered outdated and, therefore, should be offloaded to object storage. Consider that "0" is a legitimate value, which you can specify to offload the data on the same day on which your backups were created. To override this policy, click Override, select the Move oldest backup files sooner if scale-out backup repository is reaching capacity checkbox and define a threshold in percent to force data transfer if a scale-out backup repository has reached the specified threshold. When using this option, Veeam will offload the oldest inactive backup chains to attain the overall scale-out backup repository capacity below the specified threshold level. To offload your data encrypted, select Encrypt data uploaded to object storage and provide a strong password. With this option selected, the entire collection of blocks along with the metadata will be encrypted while being offloaded. If you have not created the password beforehand, click Add or use the Manage passwords link to specify a new password. Once you have finished configuring Capacity Tier settings, each time the policies you just defined are met, all the data that is located on your extents and falls under policies thereof will be offloaded directly to the object storage repository automatically. To transfer data to object storage, Veeam uses the offload job that includes additional mandatory verifications to determine whether data that is about to be offloaded is legitimate. For more information, see SOBR Offload Job.